The population of Cambodia's critically endangered river dolphin is growing for the first time in decades, conservations said Monday, hailing a major turnaround for the freshwater species. 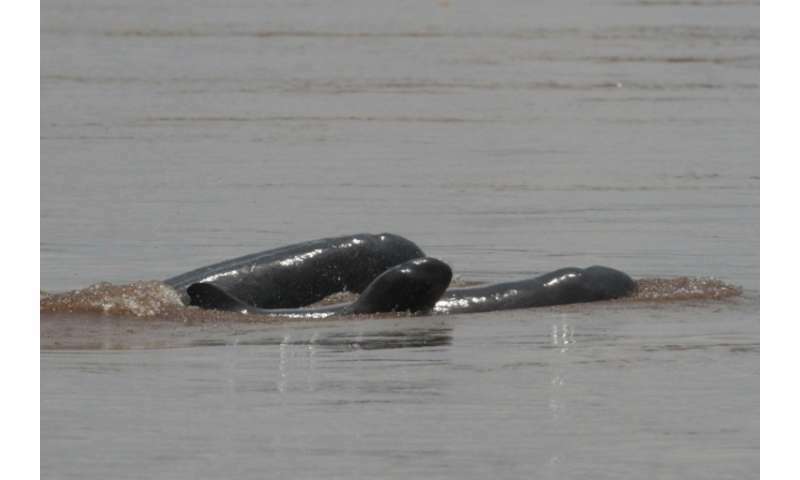 The Irrawaddy dolphins, known for their bulging foreheads and short beaks, once swam through much of the Mekong river but in recent decades have been limited to a 190 km (118 mile) stretch from central Cambodia to its northern border with Laos. The population has been in steady decline since the first census was taken in 1997, dropping from 200 that year to 80 in 2015 due to habitat loss and destructive fishing practices. But new births—including three calves in 2018—and a decline in deaths has put the species on the path to recovery. The number of dolphins in the Mekong has increased from 80 to 92 in the past two years, according to a survey by Cambodian authorities and the World Wildlife Fund (WWF), which called the rebound a "historic increase". "After years of hard work, we finally have reason to believe that these iconic dolphins can be protected against extinction," said Seng Teak from WWF-Cambodia. The group attributed the turnaround to the work of river patrol teams and the removal of illegal gillnets—vertical mesh fishing nets that are left in the water for long periods and can trap and drown dolphins. Tourist boat operators were also hailed as a "secret ingredient" for their help in reporting poaching and illegal gillnets to authorities. But conservationists and officials warn that significant threats remain, including other illegal fishing practices involving grenades, electronic gear and poisonous bait. Major infrastructure projects, such as dams in Laos, also endanger the animals' fragile recovery. Eng Cheasan, the director of Cambodia's fisheries administration, hailed the dolphins as a "national treasure" and said the government was committed to "eliminating all threats to the survival of this species". Cambodia is home to the largest population of Irrawaddy dolphins, which can also be found in rivers and lakes in Myanmar, Indonesia, India and Thailand.